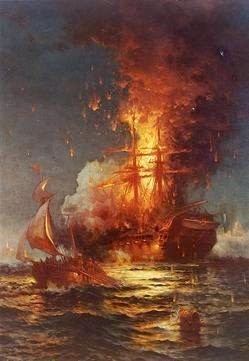 Richard Somers, Henry Wadsworth and Joseph Israel are separated by two centuries from Fernando L. Ribas-Dominicci, Paul F, Lorence and David Berry, but they share a similar fate – dying on the shores of Tripoli while opposing Islamic tyranny. 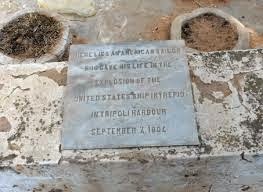 They should all have their names engraved in the Tripoli Monument at Annapolis, they should all be eligible for the Medal of Honor and all of their remains should be recovered and buried with full military honors alongside their fellow veterans in a protected cemetery, but that won’t happen as long as the top brass in the military have their way. 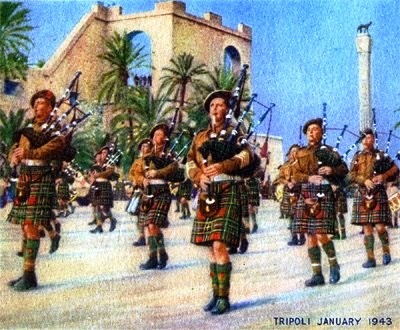 Somers, Wadsworth and Israel died fighting the Basha of Tripoli Yousef Karamanli, an Islamic tyrant and pirate, but their remains were left behind in Tripoli as prescribed by law and they are not elegible for the Medal of Honor because they fought and died in a war that preceded such traditions. 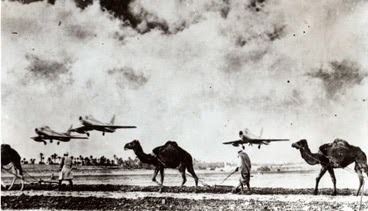 Ribas and Lorance were shot down in 1980 over Libya during Operation El Dorado Canyon, air attack on Gadhafi’s home, and while Ribas’ remains were recovered, the search for the remains of Lorance continues. Berry, a former US Marine, was killed by Islamic State suicide terrorists at the Corinthian Hotel, an attack by an affiliate of the Islamic State was said to be in retaliation for the death of Abu Anas al-Libi, who was picked up off a Libyan street by US special forces and he died while awaiting trial in New York City for the attack on a US embassy. 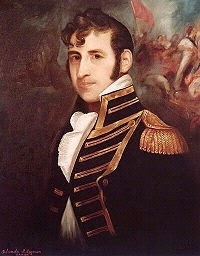 His remains were returned to his family in Libya, just as the remains of Berry were returned to the United States. 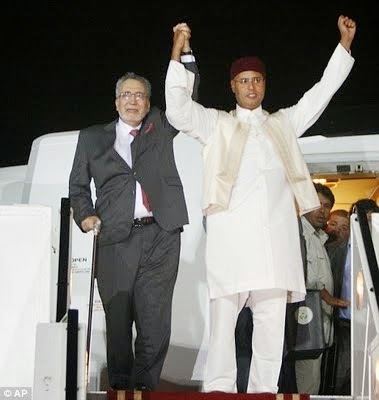 Anas al-Libi received a hero’s welcome in Libya, similar to that of the convicted Lockerbie bomber Abdelbasset al-Megrahi when he was freed from a Scottish prison. Berry’s body was returned home to his family and he was buried with full military honors in a ceremony similar to the one Chris Kyle received and as portrayed in the film American Sniper. 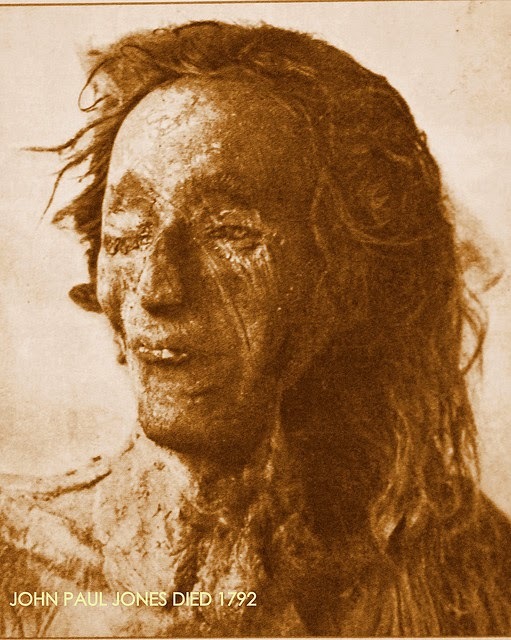 The remains of another young Navy officer from Philadelphia James Caldwell were never recovered and were last seen being mauled by dogs on the Tripoli beach, while the remains of Somers, Wadsworth, Israel and ten men of the USS Intrepid were recovered and buried on the high ground near the old castle fort by prisoners from the captured frigate USS Philadelphia. And there they remain. 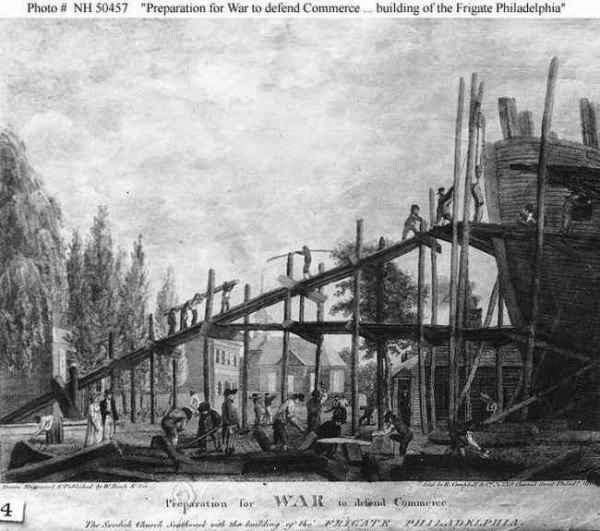 Over time other Christians who had the misfortune to die in the predominately Muslim city and society, were buried alongside them and in 1830 the British built a wall around what became known as Old Protestant’s Cemetery. 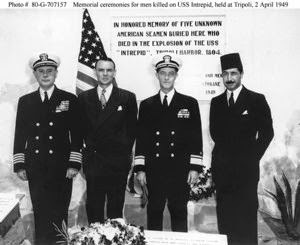 According to the most recent research including deep background from the Libyan’s own published history “Secrets of Old Protestant Cemetery,” the remains of the officers and all of the men are within the walls of the cemetery, some likely within the above ground crypts that have been identified and clearly labeled as those of the men of the USS Intrepid. 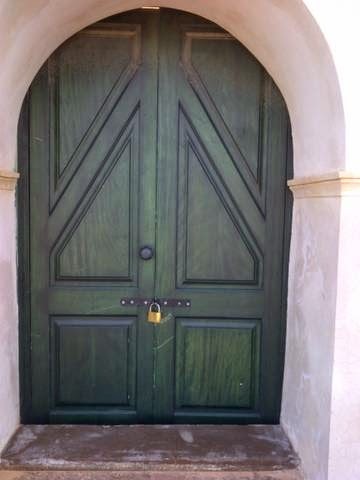 Secrets was researched and published at the same time as the Gadhafi government’s renovation of the cemetery and the U.S. State Department’s nomination of the cemetery to the United Nation as a World Heritage Site. 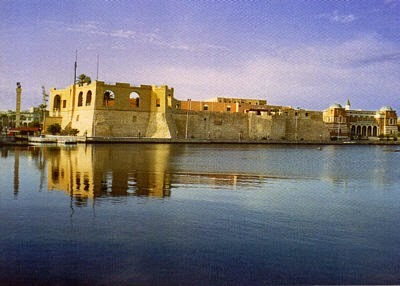 The UN however, cannot protect its World Heritage sites, as dozens of them have been damaged or completely destroyed in recent times by the same radical Islamists who ransacked Timbuktu. The twin Buda statues that stood tall in Afghanistan for centuries were the first to fall to the Taliban, stirring outrage around the world, but failing to stop the Ben – from destroying the ancient Islamic archives at Timbuktu, where they imposed strict Islamic law for a few months, long enough to dislodge the remains of Muslim saints and holy men from their tombs, as these radical extremists believe in a strict orthodox version of Islam that doesn’t permit the veneration of the dead. And they don’t allow anyone else to venerate them either. Turkey recently invaded Syria in order to save the remains of the grandfather of the founder of the Ottoman Empire, relics that were being guarded by soldiers besieged by Islamic State terrorists who wanted to destroy the shrine, relics and historic remains in the name of idolatry. 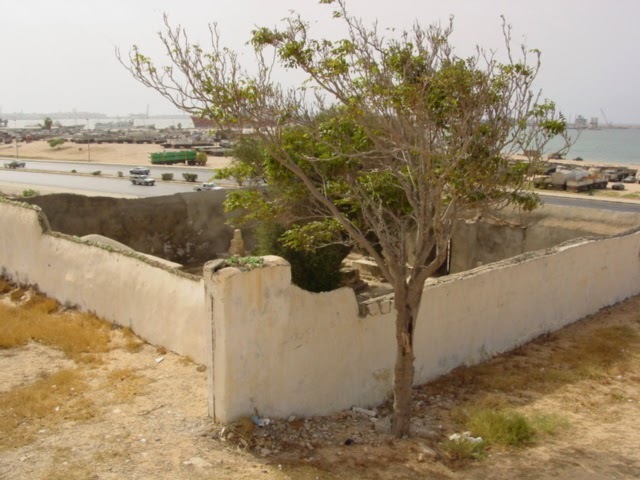 Soon after the Arab Spring and Libyan revolution radical extremists filmed themselves desecrating the graves of British soldiers at Tobruk, and dug up the remains of Islamic Sufi saints from their graves beneath the floors of mosques in Tripoli. 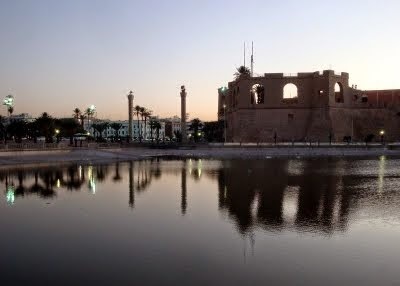 After Lorence’s and Ribas-Dominici were shot down while bombing Gadhafi’s Tripoli home in 1986, Ribas-Dominici’s remains were returned after the intercession of the Pope, but the remains of Lorence, like those of Caldwell, were never recovered. When Ambassador Chris Stevens was killed in Benghazi with his associates, their remains were returned home and received at the airport by the Secretary of State and president. When David Barry was killed by Islamic State suicide killers, his body was returned home, but the remains of Somers, Wadsworth, Israel and the men of the Intrepid remain left behind within the walls of the old cemetery, now besieged by radical Islamists. 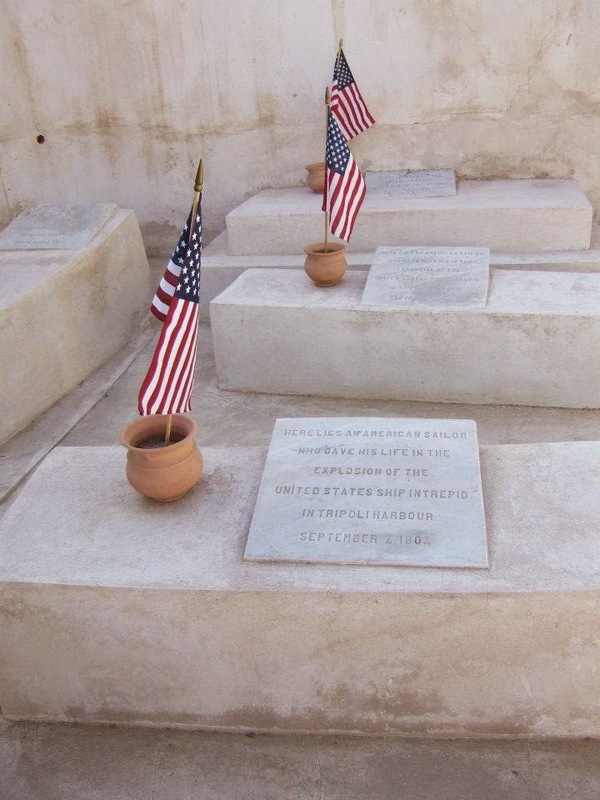 As explained by Chris Dickon in his book “The Foreign Burial of American War Dead” (McFarland, 2012), the Tripoli remains have not been recovered because the law doesn’t require the government and the military to treat all veterans equally, and only requires those who died in combat abroad since World War I to be returned home - if their family requests. President Obama recently awarded a Medal of Honor to a Civil War officer who distinguished himself in the battle at Gettysburg, but despite the efforts of Somers Point Mayor Jack Glasser and others, only those who served since the Civil War are deemed eligible for the Medal of Honor. 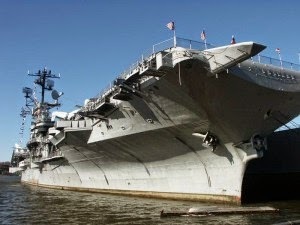 The military refused to repatriate the men of the Intrepid because, as their 2012 report affirms, they don’t have to. 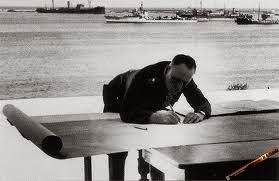 Therefore Be It Resolved: Under the Powers granted to Congress – the US government and the US military shall treat all veterans with equal status and respect without regard to when they served – and give special consideration in awarding the Congressional Medal of Honor to the officers of the USS Intrepid – Lieuts, Richard Somers, Henry Wadsworth and Joseph Israel for their leadership and inspiration in the continuing war against Islamic tyranny. 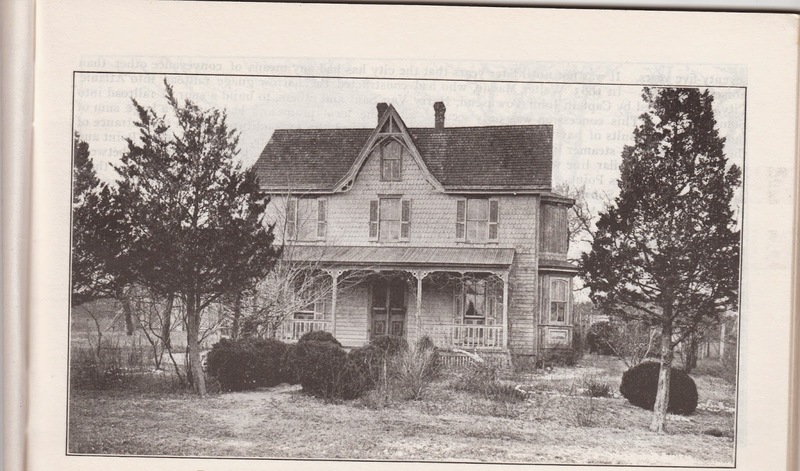 The house and tavern at Bethel and Shore Roads in Somers Point where Richard Somers was born. It still stands but was renovated into commercial offices. An historic marker marks the spot. 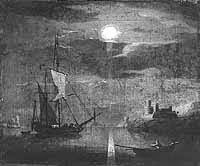 1783 March. 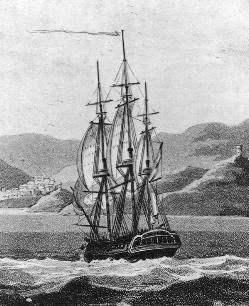 Algerian Barbary coast pirates seize two American merchant ships. 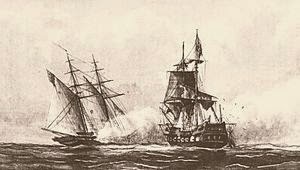 1784 October 11 Morocco pirate corsairs seize American brig Betsey. 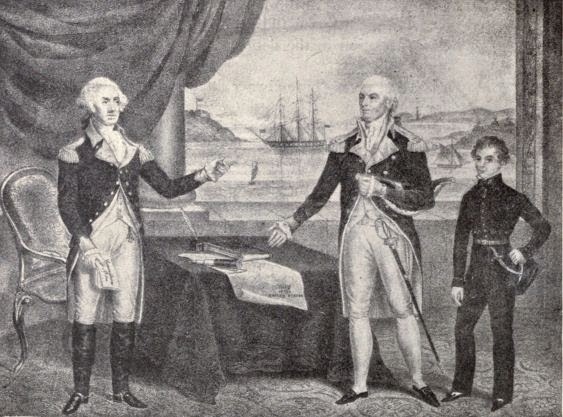 George Washington, John Barry and young Midshipman - possibly Richard Somers, who obtained a ring with a lock of Washington's hair. 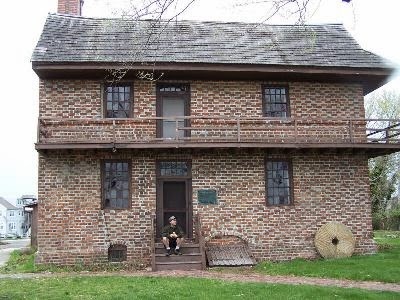 1794 Richard Somers attends private Philadelphia Free Academy with schoolmates Charles Stewart, Stephen Decatur, Jr., Richard Rush, and James Caldwell. 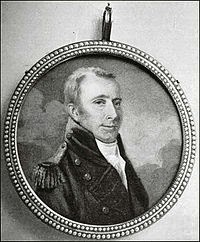 1794 October 22 Richard Somers' father Capt. Richard Somers, Sr. dies. 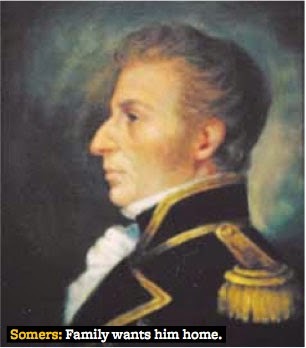 1798 June 8 Sloop Delaware (20 guns) under Commodore Stephen Decatur, Sr., takes a French prize, Le Croyable off Egg Harbor, N.J.
1801 May 22 Captain Richard Dale takes command of Mediterranean Squadron. 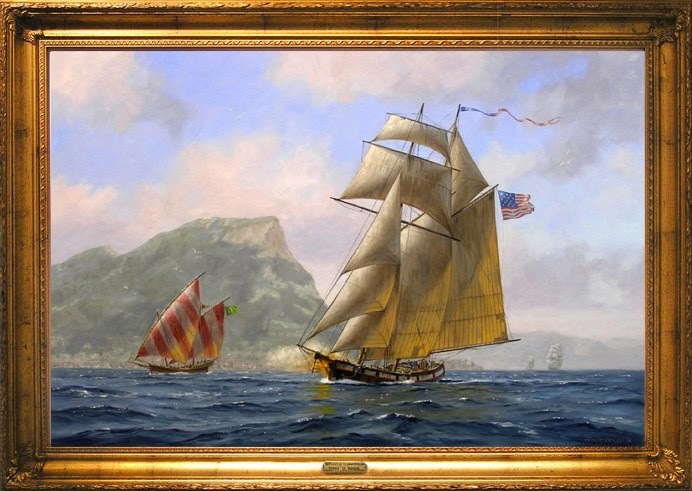 1803 June 24 Somers’ schooner Nautilus ordered to join the Mediterranean squadron. 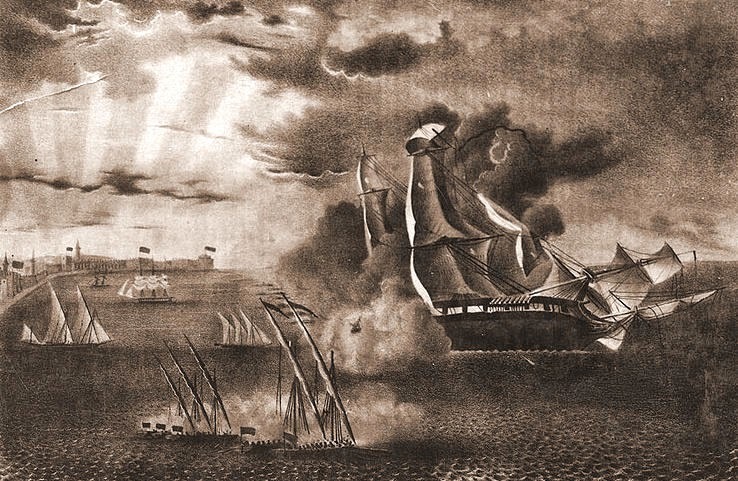 1803 Oct 31 frigate USS Philadelphia, Captain Bainbridge in command, runs aground off Tripoli, surrenders with full complement of crew, 300 men. 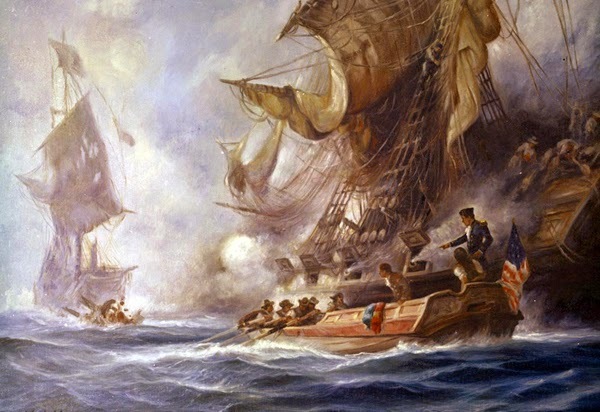 1804 July Mediterranean squadron heads for Tripoli, lead by Preble’s flagship, the Constitution, four brigs, the Argus, Siren, Vixen and Scourge, two schooners, Nautilus (Somers) and Enterprise (Decatur) and eight gunboats (156 guns in all). 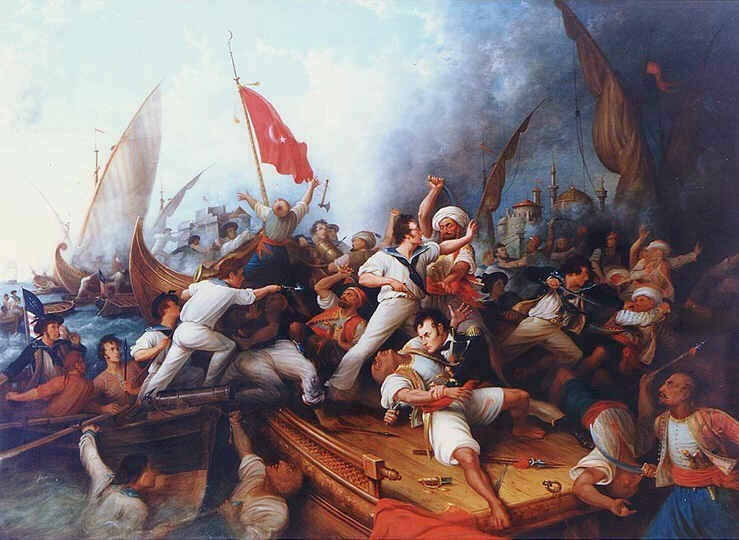 1804 July 25 Battle of Tripoli begins. 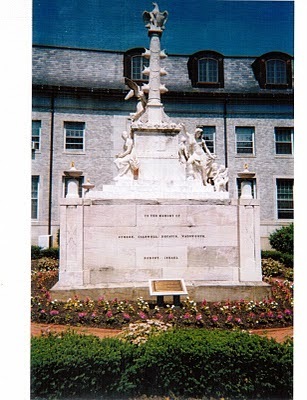 The Tripoli Monument at Annapolis was the first U.S. war memorial paid for by the offices and men who served with those officers who were killed in action - and lists the names of those officers. U.S. 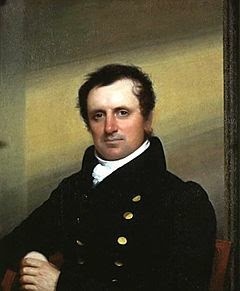 Counsel to Egypt William Eaton - warrior- diplomat - convinced Hamid Karamanli to try to win back his power in Tripoli from his renegade pirate brother. U.S. 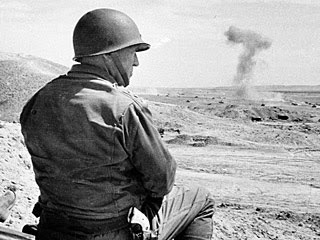 Counsel William Eaton, Lt. Presley O'Bannon and eight USMC and their motley army march across the desert and capture Derna, raising the U.S. Stars & Stripes above captured foreign territory for the first time. 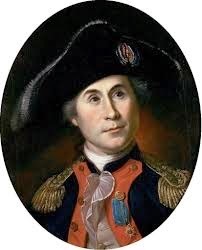 Tobias Lear, former personal secretary to President Washington, signed treaty with Yousef Karamanli that paid $60,000 ransom for the 300 prisoners of the captured frigate U.S. Philadelphia, despite U.S. policy not to pay tributes or ransom for prisoners or hostages. 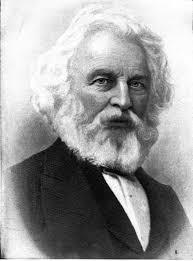 Lear later committed suicide. 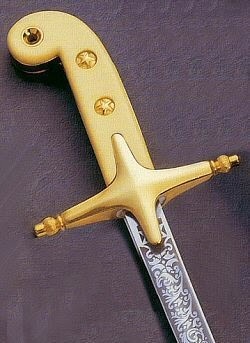 Despite being sold out by U.S. diplomat Tobias Lear - Hamid Karamanli thanked Lt. O'Bannon for fighting for him and gave him his Mammaluk sword, now the dress sword of the U.S. Marine Corps. 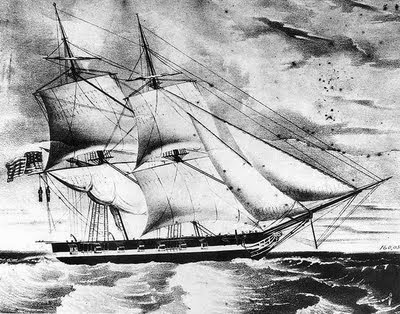 Midshipman hung for mutiny aboard the USS Somers - Inspired "Billy Bud" and the establishment of the Naval Academy at Annapolis to train midshipman. 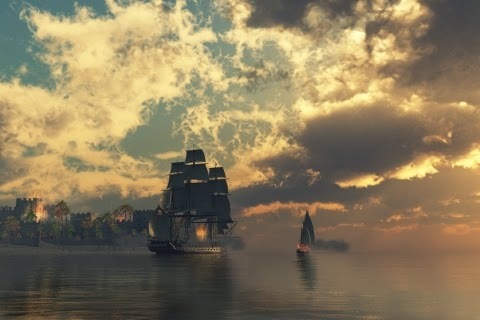 1850 James F. Cooper writes biography of Richard Somers suggesting that someday the captain of an American cruiser should return with his remains so that he can be reburied in his native land among his friends and loved ones. 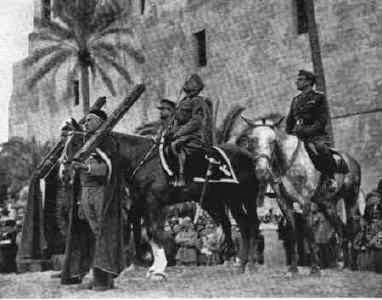 1930 Italian Army road work crew reportedly uncovers the remains of five men from the original grave site and they are reburied at Old Protestant Cemetery. 1948 - Muastafa Burchis informs the new US Consul Orray Taft, Jr. of his research and the members of the State Dept, US Navy, British embassy and local Libyans hold memorial ceremony and place historic markers at the Old Protestant Cemetery in 1949. 1950-1969 The Officer Wife’s Club of Wheelus Air Force base maintains the cemetery. 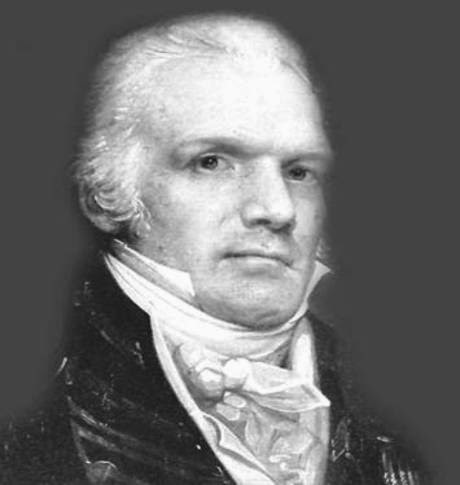 1980 Rep. William Hughes (D. 2NJ) introduces legislation in Congress to reserve graves for the men of the Intrepid at Arlington in anticipation of their repatriation. 1991 Chris Stevens posted to Riyadh, Saudi Arabia with US State Dept. 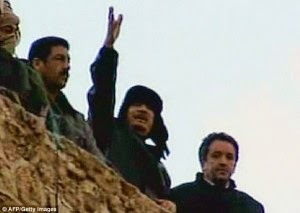 2009 Sept 5 Sec of State Condi Rice visits Gadhafi on the 105th anniversary of the burial of the men of the Intrepid but doesn’t visit graves. 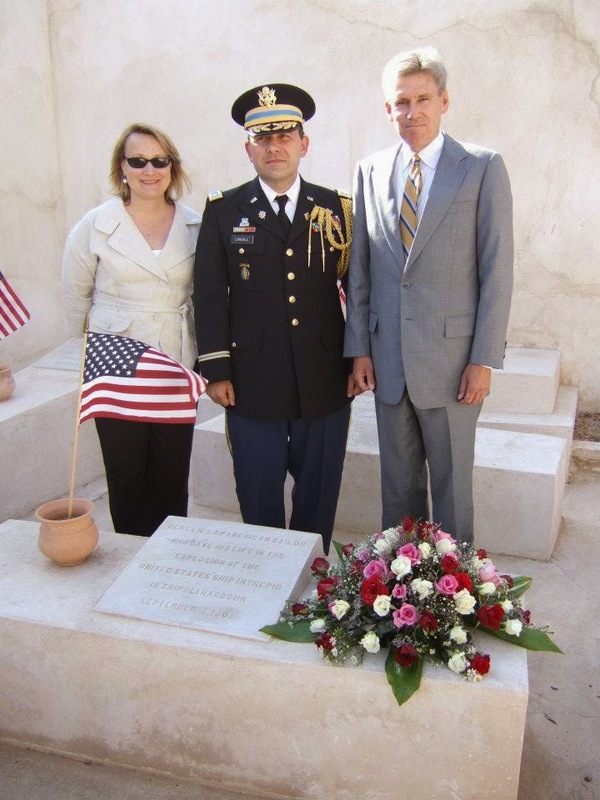 2010 March US Ambassador Cretz placed flags at cemetery graves. 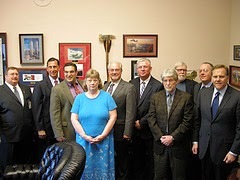 2010 April - 20 shipmates from USS Somers (DD947) meet in Oklahoma and establish the USS Somers Crew members Association. 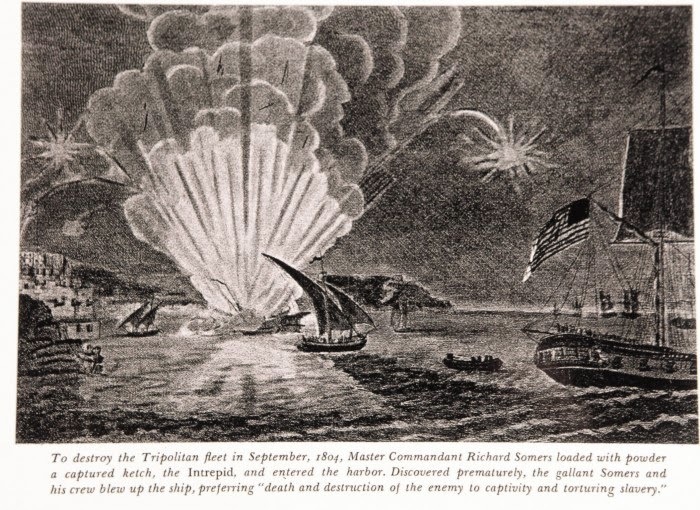 2011 April Rep. Michael Rogers introduces House Resolution 1497 to repatriate the remains of the men of the Intrepid from Tripoli, co-sponsored by LoBiondo. 2011 September – American Legion video released. 2011 Dec. 17 Sec. 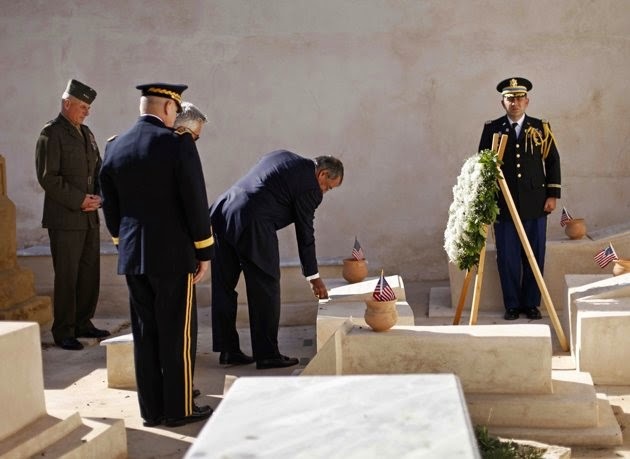 Defense Leon Panetta visits Tripoli and graves and leaves coin. 2011 Dec. 31 President Signs Defense Authorization Act that includes a provision requiring the Navy to “evaluate the feasibility” of repatriating the remains of the men of the Intrepid from Tripoli and report back with recommendations in September 2012. 2012 – AMVETES commander supports repatriation. 2012 Christopher Stevens appointed US Ambassador to Libya. Media excluded from ceremony. 2012 February – Greg Sykora does radio interview on the story thus far. 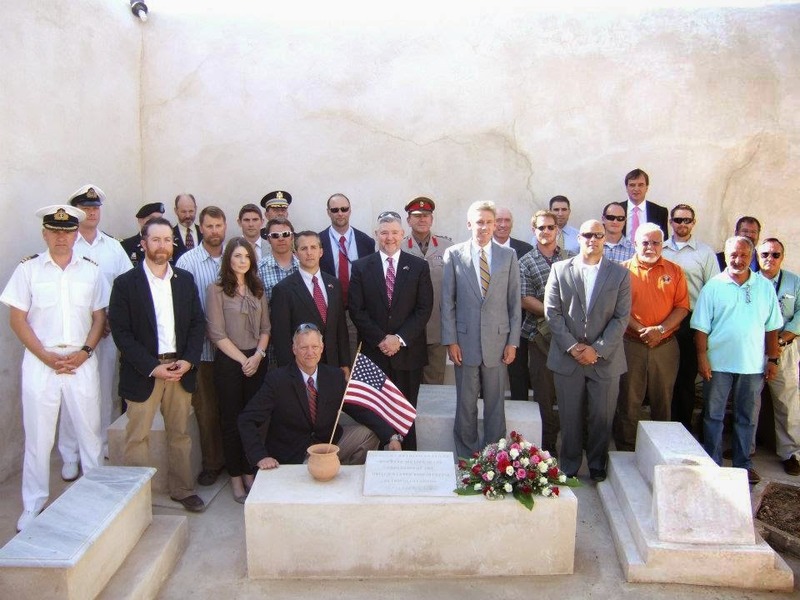 2012 May US Ambassador Chris Stevens leads Embassy delegation for Memorial Day ceremony at Intrepid graves at Old Protestant Cemetery. 2012 May – LHA 7 – USS Tripoli laid out. 2012 September Film farce "Innocence of Muslims" incites anti-American protests. 2012 September 11 Ambassador Stevens and three Americans killed in attack on US mission at Benghazi. 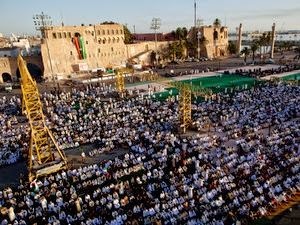 2012 September 12 40,000 Libyans protest the attack against Americans and storm militia HQ. 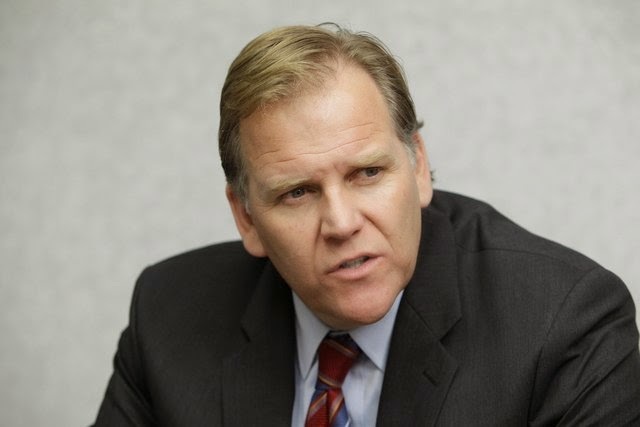 2012 September 18 UN Ambassador says Benghazi attack spontaneous response to film. 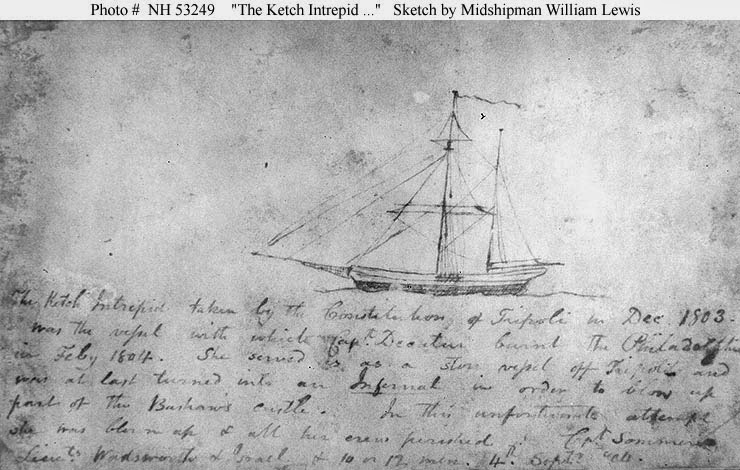 2012 October Navy/DOD Report on Intrepid remains recommends they not be repatriated. 2012 November Benghazi becomes an election issue during debates. 2013 January Secretary of State Hilary Clinton testifies before Congress about Benghazi. 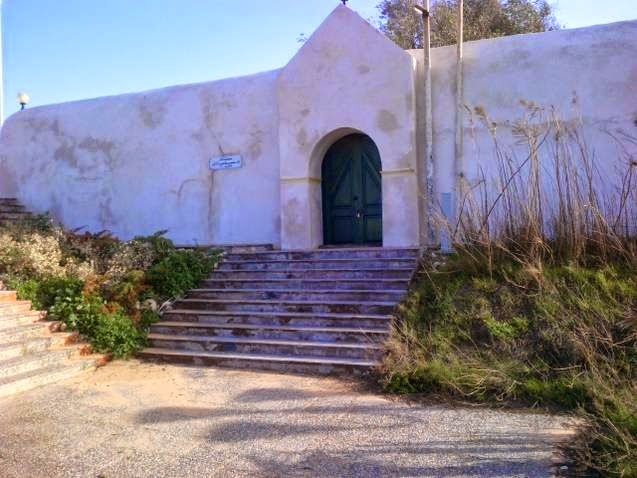 2012 January Islamic militants retreat from Timbucktu after imposing Islamic law for six months, destroy historic manuscripts, books, mausoleums and graves of Sufi Saints. 2013 Somers Point and Somers family initiate another private backchannel negotiation. 2014 Bust of Richard Somers is placed at Veterans Park next to library. 2014 “Happy in Tripoli” video goes viral. 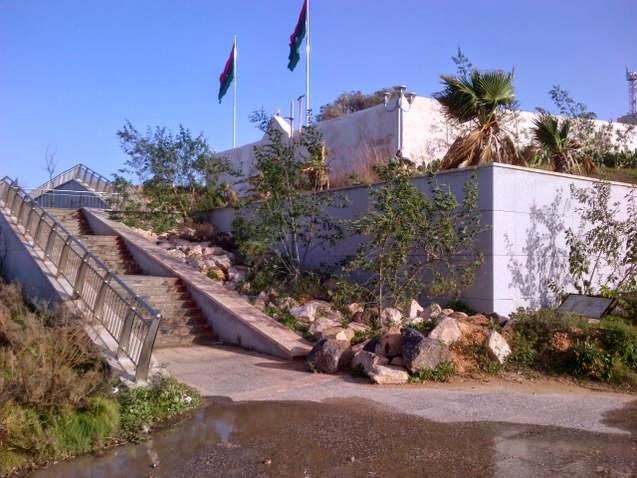 2014 Elected and recognized Libyan congress moves to Tobruk to escape militias. 2015 Philadelphia Inquirer: New calls for the emergency repatriation of remains of all Americans from Libya. 2015 Somers Point Arts Commission has Richard Somers historic murals painted on Library walls adjacent to Somers bust. 2018 June - USS Somers Crew member Association 300 strong, meet for their annual reunion in New Orleans and commit themselves to mounting a plaque at the US Navy Yard Memorial in Washington D.C. and getting a new ship named USS Somers - the seventh. 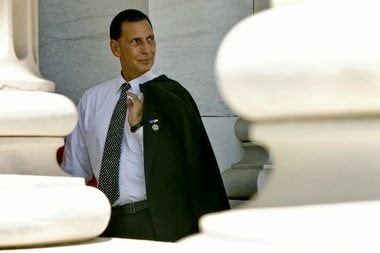 2018 August - Sen. John McCann dies. 2018 - 4 September - USS Somers Crew members dedicate plaque at Navy Yard and ask the Secretary of the Navy to name a new ship after Somers.